The Great Mango Toddler Who Haunts the White House has no interest in the content of the GOP's health care plan. It could have amendments mandating that all cars be powered by a combination of panda testicles and Girl Scout spleens and he'd be happy to sign it. All he wants is for Fox News to tell American that he won something. Speaking of which, the one important thing that all Americans can do to stop the tromp-trump-tromp of fascism in this country is to call your cable company and tell them you won't pay for Fox News. It's propaganda and it's destroying this country. 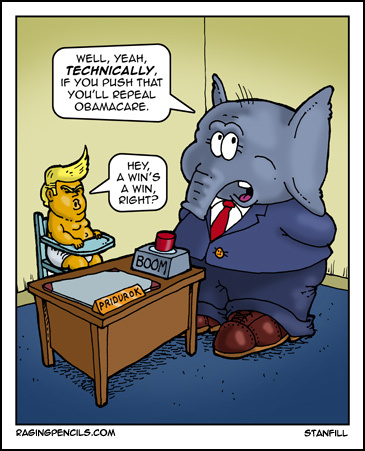 GOP elephant: Well, yeah, technically, if you push that you'll repeal Obamacare. Trump: Hey, a win's a win, right?